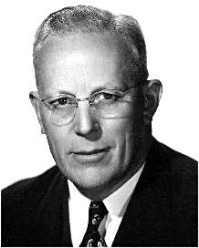 Earl Warren was born in Los Angeles, California in 1891. His father was a Norwegian immigrant who worked for the Southern Pacific Railroad, before being laid off. Warren worked his way through college, receiving a bachelor of laws degree from the University of California in 1912. Prior to gaining the governorship, Warren served as attorney general from 1939-1943, enjoying the image of an effective foe of racketeers. As a member of the state Judicial Qualifications Commission, he blocked confirmation of Gov. Culbert Olsen's nominee to the state Supreme Court, University of California Prof. Max Radin, thought by Warren (and others) to be too liberal. Sparking enmity within some circles to this day was Warren's role during WWII in orchestrating removal of persons of Japanese descent to internment camps. In his autobiography, Warren confessed: "I have since deeply regretted the removal order and my own testimony advocating it, because it was not in keeping with our American concept of freedom and the rights of citizens. Whenever I thought of the innocent little children who were torn from home, school friends and congenial surroundings, I was conscience-stricken." Warren's service as the state's chief executive stretched from 1943-1953. Reflecting his liberal tendencies was his proposal in 1945 that a state medical insurance program be instituted. A trivia question nowadays is: "Who was Republican Thomas Dewey's vice presidential running mate 1948?" The answer is Earl Warren — whose keen ambition was to become president of the United States. Warren eyed the Republican presidential nomination in 1952. But it went to the popular war hero, Gen. Dwight D. Eisenhower. It was Eisenhower who appointed Warren to the post of chief justice of the United States in 1953. Warren's successor as governor, Goodwin J. Knight, was to relate in later years that Eisenhower had promised Warren the first vacancy on the Supreme Court in return for delivering the California vote to him, but intended to renege when the first vacancy turned out to be in the office of chief justice. The court's leader, Fred M. Vinson, died on Sept. 8, 1953. Warren had the Viking spirit; he was ready to fight. As Knight (the lieutenant governor under Warren) recounted it, Warren gave the president an ultimatum: appoint him to the first vacancy, as promised, or he would resign as governor and stomp the nation, denouncing the president as a liar. The following month, Ike nominated Warren to the nation's highest judicial office. Warren won easy Senate confirmation. Here was Warren, assuming the role of the nation's top judge, with no previous experience as a bench officer, at either the state or federal level. A week after he became chief justice, Warren was walking in a hallway near his office, and noticed an awed worker snap to attention. Warren (reflecting the egalitarianism that typifies Norwegians), went over to the man, and greeted him, saying: "My name is Earl Warren — what's yours?" Justice Thurgood Marshall was to recite that incident 25 years later, at the dedication of the Earl Warren College at the University of California at San Diego. The year after he became chief justice, Warren wrote for a unanimous court in banning segregation in the nation's schools in the landmark ruling in Brown v. Board of Education. The "Warren Court" proceeded to issue a stream of decisions broadening civil rights. As a result of the Warren Court's bent, the leader of that court became a target of the right in the early to mid 1960s. Although Warren had been a vocal anti-Communist as governor, he was now denounced by Robert Welch, head of the John Birch Society, as a knowing member of the Communist conspiracy. "Impeach Earl Warren" bumper stickers were affixed to the rears of automobiles across the nation. At one massive and televised anti-Communist rally in Los Angeles, a speaker shouted that impeachment was too good for Warren — that he should be hanged. In public statements, politicians opposed to the chief justice were brutal. Alabama Gov. George Wallace snorted that Warren "doesn't have enough brains to try a chicken thief in my home county." U.S. Sen. James O. Eastland, D-Miss., charged that the Warren Court's majority has in some of its decisions "upheld the position advocated by the Communist Party." While the far-right was most vocal in assailing Warren, grumblings concerning the Warren's Court's "expansionist" utterances and "judicial legislation" were heard from those who were clearly outside the "lunatic fringe." In his memoirs, former President Richard Nixon reflected that the Warren Court "had been unprecedentedly politically active." He added: "Like many political moderate conservatives, I felt that some Supreme Court justices were too often using their own interpretations of the law to remake American society according to their own social, political and ideological precepts." In 1963, the "Warren Commission" was formed by President Lyndon Johnson. Warren headed the effort to determine if the assassination of President John F. Kennedy was something more than a one-man undertaking by Lee Harvey Oswald. The following year, the commission issued a report that concluded that no conspiracy existed. The commission's investigation has been assailed through the years as superficial by those advancing other theories. Warren retired from the bench in 1969, and died in 1974, at age 83. "High on the facade of the majestic Supreme Court building in Washington, four words are chiseled in stone: 'Equal Justice Under Law.' To a Scandinavian immigrant's son who became an embattled judge, this was no empty phrase nor architect's gimmick. Others — including perhaps the majority of today's Supreme Court — tend to emphasize the word 'Law.' Earl Warren stressed 'Equal Justice.' "
At a 1989 dinner in San Francisco commemorating the 20th anniversary of Warren's retirement, US Supreme Court Justice William Brennan hailed the chief justice under whom he had served for 13 years as a man of "absolutely granite integrity and fairness." Legal commentators generally give him high ratings for his juridical achievements. However, there is probably no chief justice of the United States who evoked greater controversy in his time. Copyright 1999-2006, MNC. All rights reserved.